At a time when aid programmes are increasingly being challenged as effective ways of tackling poverty, its appropriate that agencies ostensibly engaged in delivering aid are brought under the spotlight. WAPCo. incorporated in Bermuda, sponsor of the West African Gas Pipeline from Nigeria to Ghana, financed by the EIB in the amount of EUR 75 million in December 2006. Mopani Copper Mines plc is majority owned by Carlisa Investments Corporation, incorporated in the British Virgin Islands, that is the sponsor of the Mopani Copper Project in Zambia, loaned EUR 48 million by the EIB in February 2005. 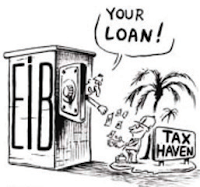 Setting aside the moot point about whether funding extractive industry programmes is the most effective way of delivering assistance to the poorest people of the countries concerned, the EIB needs to explain why it has allowed the use of tax haven structures, and to whose benefit. We hope that this Counter Balance initiative will be followed up by sharp questions within the European Parliament.